Once that’s done reboot your Pi to let the changes propagate. I am very happy with the completion of this project. It seems that all the soldering I did on the header works as intended. I will update more as I intend to use this Inky pHAT in all of my future projects. I will definitely be adding my logo on there! What is next weeks project? RPI Zero W Day 4 – Upgrades! My Raspberry Pi Zero W is now a Raspberry Pi Zero WH. Here are all of the parts before the were cobbled together. This created a USB dongle for me that allows me to log into the Pi and have a Linux based environment to work in at any time. I am no expert and with this simple how to build anyone can do this project. The first step is to solder the USB connector to the SparcFun Pi Zero USB Stem (pictured). Once you have the main grounding legs soldered to the Stem, flip it over and solder the actual USB data and power connections. As you can see I am not using a fine tipped soldering tip but if your careful and have a steady hand you can do this fairly easy. Once I had that all soldered together it was getting fairly warm so I set that off to the side and then started to work on soldering the header. This takes a little time to solder all of the connections and it also required some patience. This allows you to practice your soldering skills. About 15 minutes later I had the header all soldered on and I used some Isopropyl alcohol to clean it all up. Since the Stem was now cool I fastened that to the board with the parts provided. There is a good tutorial over at SparcFun showing how to solder castellated holes (or castellations). This might come in handy if you need to solder a module or PCB to another PCB. These castellations are becoming popular with integrated WiFi and Bluetooth modules. Here is the finished soldered and assembled project. A Raspberry Pi Zero WH dongle. Now time for the final test. Will it power up? Success! As you can see in the picture the new Raspberry Pi Zero WH powered up and booted with no problems. I immediately had to log in and run quick test or two. I just ordered Pimoroni Inky pHAT for Raspberry Pi – 3 Color eInk Display and it should have it for installation in the next day or so. I wanted to have it by the time I posted it but we know how life gets in the way. Expect a post on that in the next few days. This has been a fun project! I hope I have shown you a few things that have piqued your interest. 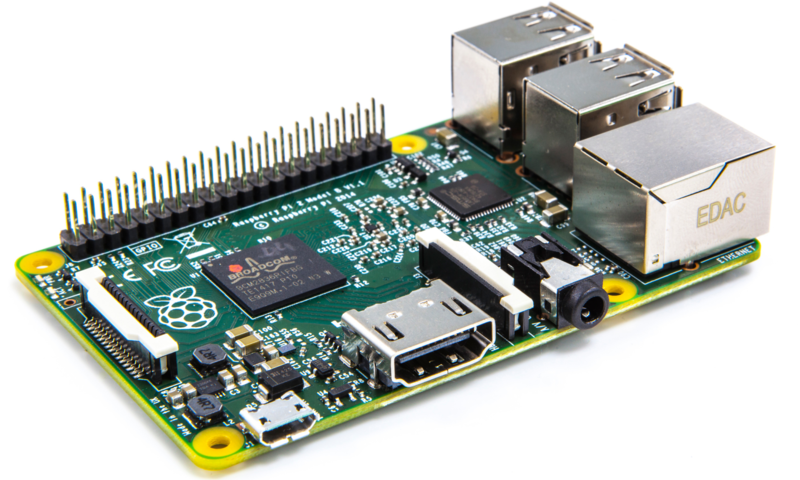 This reason I started with the Raspberry Pi Zero WH is that out of all of the Raspberry Pi versions that are available this is what I would consider the base model. Everything I have show you so far can be, and will be used on higher models of the Raspberry Pi and other Single-Board computers. I’ll see you in the next post! Today I wanted to share how I am setting up my test bench for those that are curious. I have decided to use the DINr plates from the folks over at http://www.dinrplate.com/ since their design and implementation are second to none in my humble opinion. As you can see from the photo below the board is securely fastened to the plate and then that plate is secured to the rail. All of the cables are zip tied to the plate which makes sure that the connections to your Single-Board Computer are not stressed out. The left micro-usb is power, the center micro-usb is for the WiFi dongle and the right is the micro-hdmi to hdmi converter. Stress-ng measures a stress test “throughput” using “bogus operations per second“. The size of a bogo op depends on the stressor being run, and are not comparable between different stressors. They give some rough notion of performance but should not be used as an accurate bench marking figure. They are useful to see if performance changes between kernel versions or different compiler versions used to build stress-ng. One can also use them to get a notional rough comparison of performance between different systems. They are NOT intended to be a scientifically accurate bench marking metric. I will be working with stress-ng over the next few months to see just what I can do with it for future testing. If you know some good commands please share them below. The idea behind these benchmarks is for you to see what the default setting provide you and then, if you want/need to, you can overclock your Single-Board Computer. Overclocking I will cover in later blogs. I have started with the command line testing with the RaspBerry Pi Zero W since that is where we can get the basic testing out of the way. The desktop environment on the RaspBerry Pi Zero is not very good for any kind of Internet testing. We will save that for the RaspBerry Pi 3. I will do all of the same tests on the RPi 3 so we can compare them against the RPi Zero W.
I has also planned on making this RaspBerry Pi Zero W into a USB dongle and I am also going to be adding the GPIO header to it. I would like to establish a SOP (standard operating procedure) or “methodology” going forward so all of you can create your own results. In order for this to be a fair test the following criteria were observed. All CPU and memory tests conducted using Sysbench and/or command line. All Single-Board computers were not contained in a case and used “bare”. All tests using the latest version of that specific systems preferred software. All tests were at ambient temperature before testing began. I accessed the Single-Board computers over an SSH connection. No desktop / X session started unless the tests required the desktop. All test results are a combination of the tests being run 3 times and the mean average was used for the final result. Sysbench is a benchmark suite which allows you to quickly get an impression about system performance which is important if you plan to run a database under intensive load. I will explain how to benchmark your CPU with Sysbench. If you want to learn more about the program you can look at the manual for Sysbench to learn more about its parameters. This will return the the time required to crunch the integers between 0 to 1234567. There is no direct method to benchmark a RAM and generally RAM speed denotes RAM clock speed. It is unnecessary and not conclusive to do this test but this may be considered as an experiment. As you can benchmark this data with changes you do to your system or compared to other systems. tmpfs is a RAM based super fast file system, something like a ramdisk, so by doing a read write speed test on a tmpfs mounted folder will give a rough idea about RAM speed. So, let’s have a look at commands below. Here are the results for the Raspberry Pi Zero W. I achieved around 35 MB/s write speed and 79 MB/s read speed with a 512MB of DDR2 SDRAM. On my main PC look at the result ! It’s incredibly fast ! I achieved around 4.6 GB/s write speed and 8.0 GB/s read speed with a 16GB 2400MHz DDR4 RAM. Time to clean up what you just did. My Raspberry Pi Zero W arrived and I finally had a chance to sit down and start to do some work with it. I downloaded the latest version of Raspbian, and installed it on a Sandisk Ultra Plus Class 10 microSDHC 16 GB card using Etcher. I did a lot of YouTube watching and read a lot of comments on what worked for setting up the Zero W headless. It worked fairly well for the most part as I am running it via a USB cable off a Windows 10 system. The first file you want to create is called “ssh” with no extension and completely empty. The next file you want to create is called “wpa_supplicant.conf” and you want to put the following in it. and you can now insert the sd card into the Raspberry Pi Zero W.
Remember, you need to edit those 2 files and add those 2 files for this to work the way I did it. It is not the only way but it is the way that I got it to work. Now you should be all done! Your going to want to make sure that WiFi is on under network options and that you have VNC on under interfacing options. Turn those both on and then reboot your Pi. Watch your Pi and in about 30 seconds you can relaunch your last PuTTy session and get right back into the terminal. If you want to get into the Pixel desktop you can VNC into it with VNC Viewer and do all the GUI things that you would like to. NOTE: This is a Raspberry Pi Zero W. It is not very fast in the desktop environment. I suggest that you do not log into your Google services if you are a heavy user of extensions. Your Pi will run very slow. I’ll get into the benchmark tests, how I did them with examples and how you can do the same things if you want to. I am going to be making a USB dongle out of this as the project progresses and I’ll be adding that information soon. Conclusion for day 1: not too bad! I was able to get the Pi Zero W to fully run off of one cable. For the person that wants to work in a Linux environment and have Windows at same time this is a dream come true. For the cost of the Pi and a good SD card (that you can reuse on other projects if need be) the investment is very cheap for awesome rewards. More to come! Welcome to the Single-Board Computers website! This site supports the Single-Board.com YouTube channel and you can also find us on Facebook.